Ethical Revolution is a hub for discounts and savings on ethical goods, helping you shop ethically on a budget. The site boasts a comprehensive & ever-expanding Ethical Directory with ethical businesses listed by category. The Ethical Revolution project is brought to you by Sam. Read more about Sam and the project here. There's no better time to join the Ethical Revolution. Sign up to receive 2 emails per month of the best ethical deals. 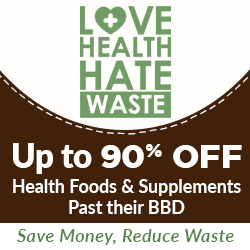 Be financially healthy and get up to 90% off health products beyond their Best Before Date or in damaged packaging but still fine to consume. Receive a FREE Montezuma’s Mini-bar Hamper when you switch your energy supplier to Ecotricity. Ecotricity electricity & gas have the lowest carbon footprint of any available in Britain. Join the Ethical Revolution. Wear your colours with pride. Promote sustainable fashion and ethical trading. All tshirts are 100% organic cotton. Responsible. Renewable. Organic. The Only Way Is Ethics! Envirofone are the UK’s leading mobile phone recycler: Recycle your old mobile phone and receive cash for it! The challenge is to move as fast as possible to renewable energy and away from fossil fuels. The future is now. Is there really still a climate change debate going on? That was so 2004, it’s time to get on with it and focus on implementing the solutions. There is no need for discussion anymore, renewables are the future, it’s inevitable. It affects every aspect of our lives, is often said to be the root of all evil, and the analysis of the world that it makes possible – what we call ‘the economy’ – is so important to us that economists have become the high priests of our society. Yet, oddly, there is absolutely no consensus among economists about what money really is. If they indoctrinate you, so that their interests become your desires, that is the worst kind of slavery. Promotes journalism that raises awareness of solutions to social and environmental challenges and celebrates humanity's achievements and potential. A movement of consumers, investors and workers counterbalancing the power of large corporations to forge a just, sustainable path for the global economy. Award winning author of No Logo, Fences and Windows, The Shock Doctrine and This Changes Everything, Naomi is a social activist and opponent of corporate globalisation.